The Kyan community association in Itoman, Okinawa held their annual newborn celebration, “Chiritancho” on the afternoon of December 25 in the Kyan Community Center. The celebration is for babies born in 2016, and wishes them a long, healthy life. 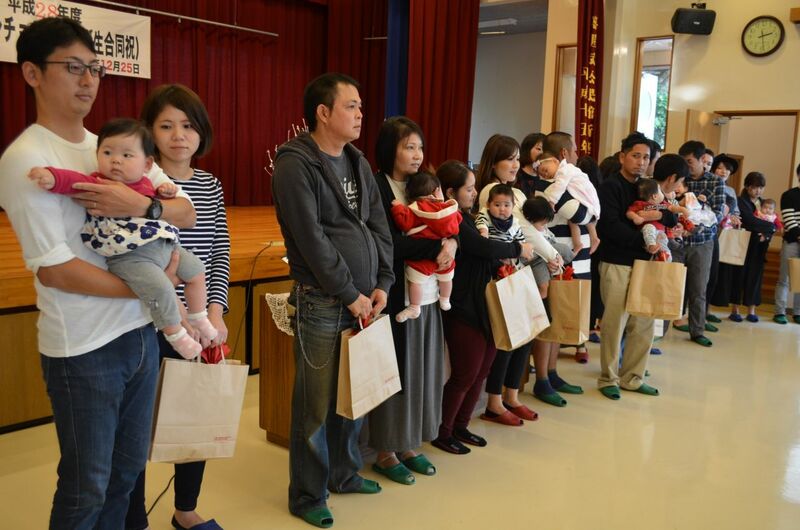 Sixteen of the 25 babies born this year in Kyan participated with their parents, and were celebrated by local residents. Chiritancho is a traditional event with Christian influences that has been celebrated in Kyan for 340 years. After introducing each newborn individually, Kajadefu and youth-group Eisa dances are performed in celebration. Akira and Amari Motomura, parents of 8-month old Hikari, one of the participants, said happily of the celebration, “It’s great that the entire community comes together to value children. This is our first child, so we want her to grow up healthy and thrive. We hope that this celebration stays with her until she grows bigger.